We are able to MOT test Class I, II, III and IV vehicles, which is anything from scooters to Vans up to 3000KG (Including trikes and quad bikes). It is not always necessary to book an appointment and we can often do your MOT while you wait. We always ensure there is an MOT tester available for every class of vehicle we test. Everyone who uses a vehicle on the road is required to keep it in a roadworthy condition. The purpose of the MOT Test is to ensure that cars, other light vehicles (including some Light Goods Vehicles), private buses and motorcycles over a prescribed age are checked at least once a year to see that they comply with key roadworthiness and environmental requirements. 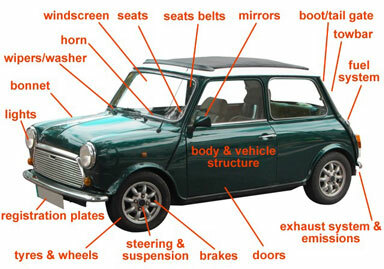 When your car is tested, the MOT looks at some important items to see if it meets the legal requirements. 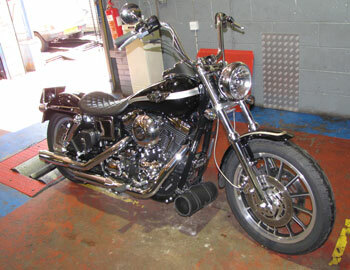 The MOT certificate is not a guarantee of the general mechanical condition of a vehicle however. If a car is registered with no prior use on the road, the MOT will be required three years after the date of registration. For example, a car registered "from new" on 25th April 2007 will require its MOT no later than 25th April 2010. If a car is used prior to registration, as would be the case with an import, the MOT will be required three years from the end of the year of manufacture. For example a car manufactured at any time in 2007 will require an MOT no later than 31st December 2010. There is no grace period given after these dates. If the vehicle is presented for test within the calendar month prior to the date that the MOT is due, the test certificate will run from the date of the test to one year after the expiry date of the current certificate (e.g. if the current certificate was due to expire on 1/4/12, and the vehicle was presented on or after 2/3/03, the certificate would run from the test date until 1/4/13).